One month before I left for the United States, two friends came to me and presented an idea to offer support to train 40 street children and eventually help them become self-sufficient and productive members of Hawassa. They both were working in local organizations, which they had founded called Concern for Street Children Association (CSCA) and Bright Light Missions (BLM) to help a small number of children, 8 and 10 respectively. The model that they proposed to me was based on the CSCA model which had been working for over 9 months where street children would attend school half of the day and work the remaining time in small businesses so they could pay their rent and food costs under the supervision of concerned adults.They proposed that they would select 40 children to receive training in character development, life skills and small business management in a training center where, besides the training, they would receive two meals per day and recreational activities (i.e. football and volleyball). After hearing of their vision, I agreed to arrange for funding through our connections for the month we were in the United States and thereafter we would evaluate the effectiveness of the pilot project. Upon returning from the United States we met with our friends again and discovered that, after getting approval with local officials, they had arranged a rent-free training site at a local governmental school during the school’s vacation break, had selected the 40 children and of all who had been attending the training daily, only 4 of the children had dropped from the program. They had arranged to reduce the food costs of the program by 50% as they had procured donations from local restaurants. They further reported that 10 of the children had been experiencing persecution for wanting to stop their addictions and needed a safe place to sleep. As a result, they had arranged for the remaining 36 children to sleep at another government school so they could sleep safely at night. The picture shown here is at a football game between the street boys in the training center and the boys in the two transitional homes of our friends. 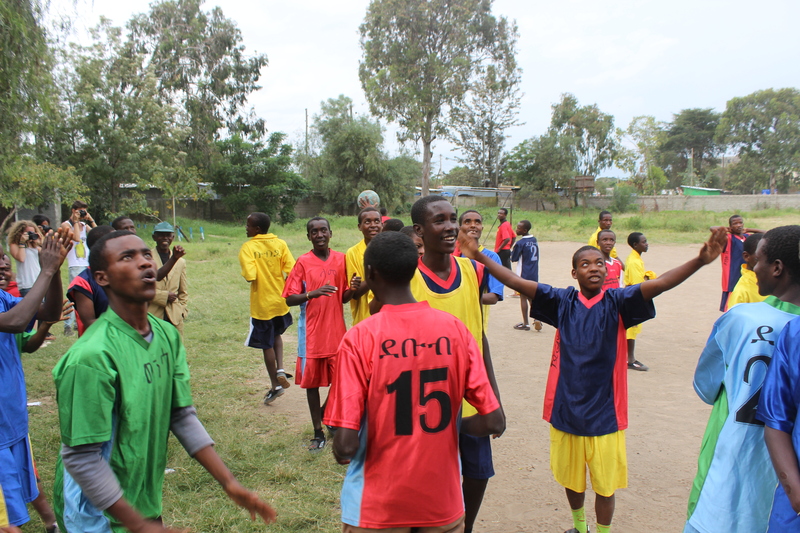 They all had been given new football jerseys and shoes by a government donation because of the high favor the innovative project has received. The next phase of the program will begin soon when the boys begin to develop their own businesses and move into rooms in groups of 3-4 per room and begin being supervised in the community by a caseload manager.